Plastic bags are seen in the public eye as a growing environmental problem. They don’t break down, can be harmful to wildlife, and cost a lot to dispose of. The New York City Department of Sanitation alone spends an estimated $12.5 million/year to handle roughly 73,000 tons of plastic bags. These statistics along with pressure from environmental activist groups have led New York Governor, Andrew Cuomo to propose legislation banning single-use plastic bags as part of his 2019 budget. According to the governor’s budget, the ban will help to reduce greenhouse gas emissions associated with bag production and disposal, from petroleum used to produce the bags and emissions from the transportation of discarded bags to landfills. From a business owner’s standpoint, though, plastic bags serve as a low-cost solution they can provide for their customers to carry goods out of their establishments. This legislation could put strains on their business as they struggle to find suitable alternatives. At Johnston, we want to make sure our customers are aware of some of the alternatives to plastic bags to ensure that they are prepared for a potential plastic bag ban in New York. The most cost effective replacements for one-use plastic bags are paper bags. Partnering with Duro Bag, Johnston offers paper bags of all sizes to fit the needs of establishments from large grocery chains to small delis. Additionally, many sizes are available for custom print to reinforce your brand post purchase. Some proponents of the plastic bag ban insist that it be accompanied by a fee on each paper bag used in place of plastic bags as part of a push for increased use of reusable bags for shopping. For the time being; however, no such paper bag restrictions appear to be included in the proposed legislation or on the near horizon. New York is not the first state to consider a plastic bag ban and some have already succeeded in putting a ban in place. 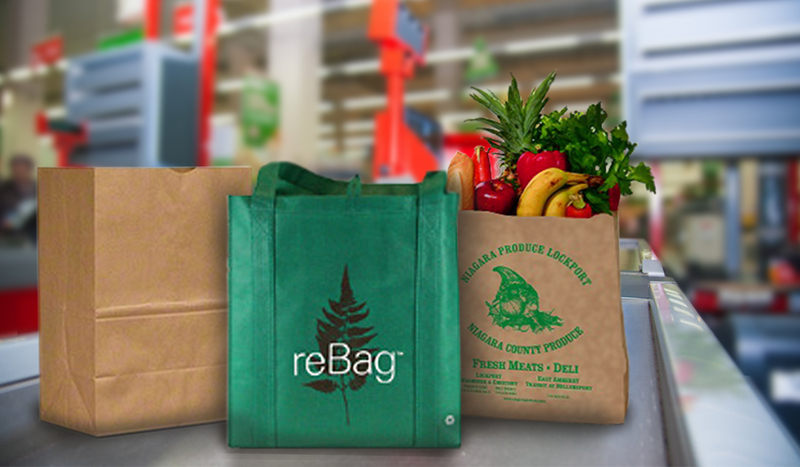 In these areas we are seeing a rise in the popularity of reusable bags like non-woven or canvas bags which can be used regularly with little wear and tear. These are a great alternative if plastic is banned and your establishment does not have enough storage space to support a switch to paper bags. Johnston can help set you up with a bulk order of reusable bags which could be gifted or sold to loyal patrons of your venue for repeated use. Johnston works with leading vendors to offer sustainable alternatives to plastic bags. Our dedicated specialists can help you identify the products and processes that are most suitable to your unique situation.